Love, love, love these turtle prints! Disappointed that they arrived with one frame damaged. They are so much prettier in person. They are out of stock now so, I am waiting from them to come back in stock to reorder. So cute! The colors are soft blues and greens, the sea turtles have great expressions on their little reptilian faces, and they're lightweight enough to hang with one nail. Purchased the set with black frames only because all of my wall art are framed in black. And of course these are hung in the bathroom. Overstock had the cheapest price for this in comparison to my usual other online shopping sites at the time of purchase. Arrived quickly and packaged well with no damage. 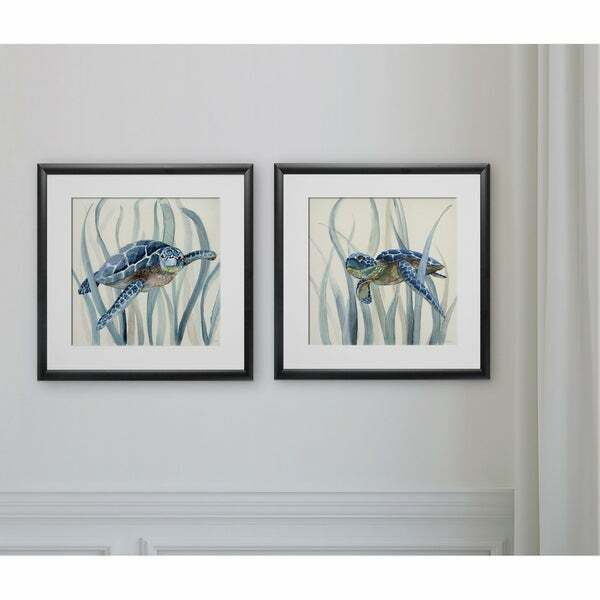 My daughter loves these turtle pics for her bathroom! They have a lot of detail and just enough color to add something without overpowering the new restoration we spent a good bit on. They have other pics to go with these too!